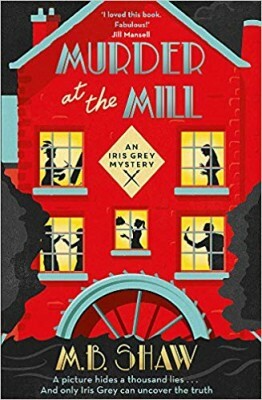 This week we are playing catch-up again with reviews of mysteries that have come out in the last couple of months-Deceased and Desist: A Tallie Graver Mystery by Misty Simon, Murder by the Book: Beyond the Page Bookstore Mystery by Lauren Elliott, Murder at the Mill: An Iris Grey Mystery by M.B. 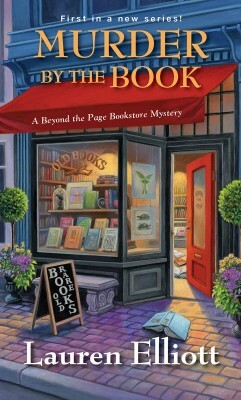 Shaw, The Novel Art of Murder: A Mystery Bookshop Mystery by V.M. Burns. Details at the end of this post on how to enter to win a copy of all 4 books, along with links you can use to purchase them. If you have ad blocker on you won’t see the Amazon links at the end of each review. Divorced from Walden Phillips III and no longer living the life of a self-centered socialite, Tallie Graver is back at home living with her family and working part-time at their Pennsylvania Graver’s Funeral Parlor. Despite pressure from her father and brother to join the family business full-time, that’s the one thing Tallie knows she doesn’t want. Until she decides on what she does want to do, Tallie’s more than happy cleaning houses for the very people with whom she once socialized. It’s while she’s doing some enjoyable window washing that she spots an obviously dead man in one of the bedrooms. Despite falling off of the ladder in a failed attempt to juggle a call to 911, Tallie is certain that she wasn’t confused enough to realize that Mr. Eli St. James did not die from an accident. She seems to be the only one with that opinion, though, as the investigating Detective Hammond aggressively warns her away from interfering in what he declares is most definitely not a murder case. Although she has no real connection to the victim, finding the body has Tallie feeling responsible not just for the death but for the principle of justice. She also doesn’t like being told what to do or that she’s wrong, which is why Tallie looks into the life of a much disliked, and possibly unethical, building inspector. Police Chief Burton normally doesn’t hesitate to tell Tallie to mind her own business, but when sidelined by an injury he shockingly asks for some snooping assistance. Her doing so puts her distinctly at odds with her own family, and it doesn’t help when she inadvertently lands herself in jail from some authorized entering. Tallie’s not about to give up, and she learns more about Eli St. James expansive business practices that may have included a sideline of private investigation. Along the way she somehow finds herself adopting a 100-pound Saint Bernard puppy, hosting a client’s annual practice funeral service, and discovering more corpses outside of the funeral parlor than within it. Readers will be more than happy to join Tallie in her exuberant investigations, especially when she is the underdog fighting against an unreasonable police force. Tallie’s frustration at being ignored and underestimated is vividly conveyed, making her moments of revenge against her know-it-all brother all the more enjoyable. Being raised in a funeral parlor has definitely given Tallie a wry sense of humor, not to mention a roll-with-it attitude that keeps her afloat despite the obstacles thrown in her path. 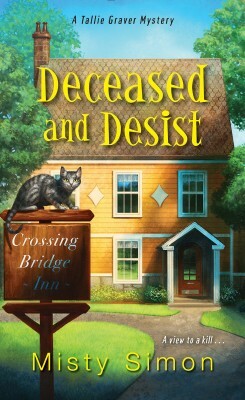 Tallie continues to discover an unwanted talent at dealing with funeral parlor disasters and in counseling mourners, although it is her ability to finally stand up to her father that gives her a shining moment. Now that she’s back living and working at home, it’s not surprising that Tallie finds herself once again relegated to the role of little sister in the family. Watching her succeed not just in her investigations but in establishing her independence, makes this a thrill of a read, and the laughs ensure for a very un-morbid mystery. Though only in her early 30s, Addie Greyborne has seen her share of tragedy. Her father was killed in a car accident and her fiancé was murdered. When a great aunt she didn’t know she had also dies, Addie inherits more than just the house. It seems her family founded the small New England town. She has a legacy. When exploring the house, mansion really, Addie discovers she’s also inherited a huge number of books. Some are rare, some could be, and some are well-loved reading copies. Overwhelmed at the full shelves, she decides to open a rare and used book store. One of her new business neighbors, Martha, is hateful from the start. Luckily, Serena, who owns the tea shop, becomes an instant friend. A series of break ins at the store and the house also let Addie become friends with the police chief Marc, who is Serena’s brother. It seems the thieves are looking for something in particular although Addie has no idea what it could be. When the dead bodies start to turn up, Serena is the obvious suspect for the first murder. In order to save her friend as well as her own sanity, Addie begins to investigate. A mysterious black sedan, two suspicious customers, a warning, and more, let Addie know she’s getting close to a solution, but a solution to what? I like the setting in a small New England town. Serena makes a good best friend, and Paige, who Addie hired for the bookstore, shows a lot of promise as a character. Addie does repeatedly put herself in dangerous situations. In spite of multiple warnings to stay out of the investigation, she doesn’t listen and not only gets away with it but Marc confides in her about the case. Since Serena is the suspect and Marc is her brother, it’s an awkward situation. One problem I had with the storyline is that Addie came to town for her inheritance, scouted locations for the store, had to get permits and licenses—yet no one knew she was opening a bookstore until opening day. It seems to me that in a small town, rumors and news fly at the speed of sound, so why weren’t gossips spinning in excitement over a huge inheritance, the last of the family line, and a new store? It would be impossible to keep that a secret. This is the first in a new series. Look for Prologue to Murder, coming soon. When Iris Grey first came to idyllic Hazelford, England, she was struggling to pull herself out of depression. Her marriage to failing playwright Ian was crumbling, and she had left him to stay in the Mill Cottage to find inspiration for her painting. Iris had long admired the cottage owned by bestselling crime author Dom Wetherby, a celebrity not just for his popular book series but for the television series it inspired. Iris’s first meeting with his son Billy is less impressive, as Iris interrupts him while he is in a near-physical argument with his mother. Aridne Wetherby attempts to downplay any strife, and in fact hires Iris to paint a portrait of Adriadne’s bigger-than-life husband. Iris finds herself unsettled by the flirtatious Dom Weatherby, especially when he seems to always power-play for dominance and see through her into her secrets. Although the reclusive artist would rather hole in at her cottage and hide away from social interaction, she’s unable to politely turn down invitations to celebrate Christmas Eve in the Weatherby estate home. Iris soon learns that the relationships within the Weatherly family are filled with rivalries and resentments, and when the author is found drowned and weighed down by a rock, Iris is unable to believe that the narcissistic writer would have committed suicide without leaving a note. Iris’s own severed relationship with her mentally troubled sister has Iris more than a little sensitive to the lingering effect of family abuse, which serves both to cloud and to help focus her observation of the Weatherbys. This is a novel where it is impossible to escape the increasing sense of doom and menace that pervades what initially appeared to be such an idyllic town. Like Iris, it is impossible to know who to trust or whose lies hide not murderous intent, but embarrassment or pain. The crimes have been set in motion decades ago, and it is apparent that the deceptions have only infected and spread. By the end, readers will feel connected to these characters and be invested in their futures. This complex, intricately woven novel starts off the adventures of an intriguing heroine finding her sense of self and strength to forge a new path for her life. In the months since she retired from teaching and fulfilled her dream of opening a bookstore n North Harbor, Michigan, Samantha Washington built up a profitable business within her Market Street Mysteries store. She’s even begun tentatively sticking her toe back in the dating pool after the death of her husband with North Harbor Café owner Frank Patterson wooing her with his delicious meals as much as with his charm. Throwing a curve ball into Sam’s new life is the news that her Nana Jo has just lost the lead role in the Shady Acres Senior Follies to rival Maria Romanov, whose acting skills are as abysmal as her singing abilities. No one can explain why visiting Tony award-winning director Horace Evans cast Maria in the first place, but when she is murdered Nana Jo’s rather exuberant insults and threats ensure that she now has the role as the primary suspect. Desperate to have her grandmother cleared before their scheduled trip to New York, Sam rashly begs Detective “Stinky” Pitts to give her ten days to clear her grandmother. If she hasn’t found the real murderer by that time, he is free to make the arrest. Maria’s recent move in Shady Acres has Sam and company investigating the senior living facility, where it appears that Maria may have wielded her acting skills as much onstage as on. Startling news from her mother only adds to the pressure weighing on Sam’s shoulders, which is why she once again finds solace back in her fictional world of 1938 England. Her first manuscript featuring Lady Daphne and Lady Penelope has already gained Sam a literary agent, and her second book takes her characters into the home of Winston Churchill. 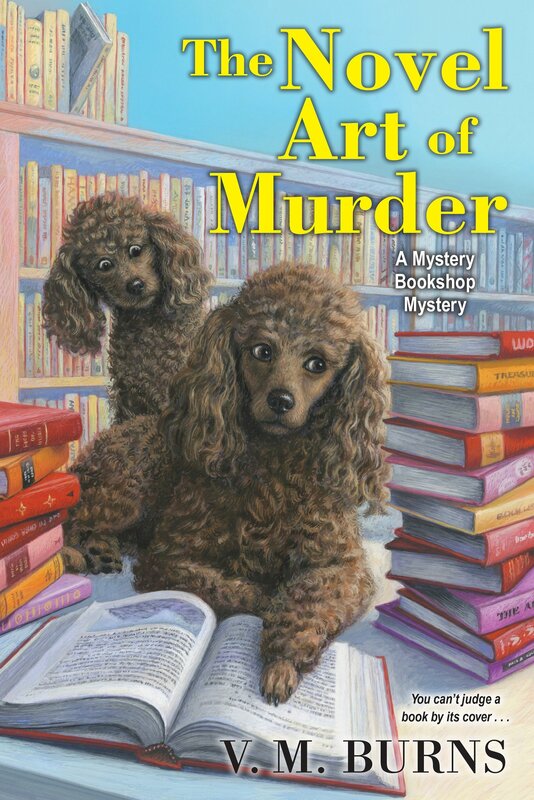 Sam sorts out real world clues and puzzles through her blossoming novel, and working through a locked-room mystery Sam gets closer to finding a killer in both worlds. The charm of this series continues to be how well Sam’s “fictional” novel is interwoven into her “real” investigation. Readers will easily see how her present actions are reflected in her writings, which astounds by a historical novel full of fascinating characters. While Sam’s first novel highlighted the adventures of Lady Penelope, here it is her sister and mother who assume the center stage to defy stereotypes and take action. Not only are readers presented with a pompous Winston Churchill, they see the now-absurd demands of potential royal brides. Elements of Sam’s investigation in Michigan are quickly integrated into her novel, and one can nearly see her thought-processes unfolding upon the page. The novel-within-a-novel, a locked room mystery, and appealing romances taking place both in Sam’s imagination and in her life ensure for a satisfying, unique, and extremely witty read. To enter to win a copy of all 4 books, simply email KRL at krlcontests@gmail[dot]com by replacing the [dot] with a period, and with the subject line “february catch up,” or comment on this article. A winner will be chosen February 9, 2019. U.S. residents only. If entering via email please include your mailing address (so if you win we can get the book sent right out to you), and if via comment please include your email address. You can read our privacy statement here if you like. These books sound amazing and interest me greatly. Thanks. They all look like good reads, thanks for offering them to us! What a great bunch of books! Thank you for the chance to win them! I would love to read these. The covers are great. Thank you for the great giveaway. These look like awesome books. Great selection of books from great authors. Looking forward to reading. Wow! Would love to win these! So much fun looking at all these. Definite adds to my TBR pile. It does seem odd that nobody would know a bookstore is opening in a small town. That sort of thing would be big news in population centers of several thousand people. I’m entering the contest. Pretty exciting.